Ok, really its the same subject as the last article, but I want to share the content! Many of the design strategies implemented at the Earth Rangers Centre are relevant to your home – energy efficiency, high levels of thermal comfort, water efficiency and careful attention to indoor air quality levels. No, not many homes will be able to implement all of these technologies at the same time, but this article shows what will result if you are able to implement everything on your green building wish list. On a side note, this is my first experience writing a “peer reviewed” article, and the team at ASHRAE’s High Performing Buildings was patient and professional. Have a look a the article, I think the results speak for themselves. Please Sir, Can I Have Some More (Conservation)? The Environmental Commissioner of Ontario (ECO), Gord Miller, recently released a report summarizing the progress of Ontario’s energy conservation measures. In short, there is good news and there is bad news. Everyone loves the good news first so here it is: conservation results in 2011 were “generally encouraging” meaning that consumed energy and peak demand decreased, with some pretty big caveats. Energy saved in this reporting period was the result of investment in the previous period, results were mixed at best in the residential sector, and so on. I encourage you to read the full report here. 605,000,000 kWh were saved at the cost of $0.03/kWh. Peak demand was reduced by 16% of the 4 year target. We seem to be on track for consumption, with work to do on demand reduction. Now the bad news. We are focussed almost entirely on how the power we consume is generated and where its coming from. “Wind turbines are ugly” or “they’re not putting a power plant in MY neighborhood” comments drive me crazy. The Green Energy and Economy Act, political hot-potatoe that it is, has not been implemented with nearly enough focus on “the culture of conservation” as promised in its’ initial rollout. More power plants wouldn’t be needed if we didn’t need more energy. So what to do about this? Obviously, if you have read any of my other posts, my opinion is to invest more heavily in conservation, agreeing with the ECO. Simple conclusion, but how? Engage people. Make it easier, heaven forbid maybe even fun, to save energy. Collaborative apps and websites are coming along. 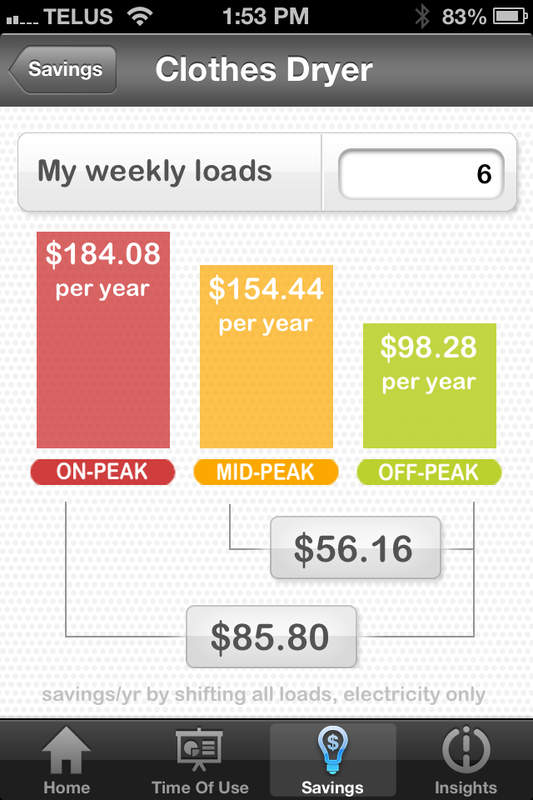 Apps like Powercents give plenty of tips on how to reduce home energy use, and how to manage time of day price differences to home owners financial benefit. Gridwatch, another app from Energy Mobile, shows users the power sources required to supply consumed energy and the resulting CO2 emissions. I’m looking forward to an upcoming update that will show emissions per kWh in real time based on the province’s energy mix at that time. I agree with the ECO that the price difference between on- and off-peak just isn’t big enough to encourage real changes in behaviour, and my house is the perfect example. My wife is home on mat leave with my 6 month old son, and does the majority of home tasks when she can, irrespective of what time of day it is. If I tell her that we can save $0.27 cents per load by doing it at night instead of during the day, she’d throw a quarter at me and tell me to be grateful its being done, and I don’t blame her. Make that a dollar per load, and she’d likely think twice, quickly equating that to $6 per week, almost $30 per month. We have the tools in place to evaluate, learn and change our behaviours with resulting dollar savings and reduced environmental impact. I spoke with Faizal Karmali, one of Quinzee’s founders some months ago, and he envisioned neighbors competing against each other to reduce energy use. I would love to beat the pants off my neighbour at something that saves me money AND reduces all the environmental impacts that result from power generation. See what time the oven was turned on? I will admit that I am a gadget geek. Electronics companies love me, as I am always interested in trying the latest and greatest. That love of bigger, better, stronger, faster, has translated into my professional life as well, albeit now tinged with green – high performance buildings. Now it’s smaller, better, faster and more efficient that I am gunning for. As you can see from my other posts, that extends into my personal life as well. For some time now, I’ve been looking for a way to reduce, if not eliminate, my gasoline purchases, and to green my commute. My gadget obsession extended to my previous car, and I tinkered with it as a bit of a project. A rally car converted from an econo-box, the Subaru Impreza WRX has served me faithfully since I purchased it new in October of 2005. The good: its a tank in snow thanks to snow tires and full-time all-wheel-drive, it has more than enough power to make your hair stand on end, and it’s sharp looking (the functional hood scoop ramming air into an intercooler to cool turbocharged air is a pretty distinct feature). The bad: 10 to 11 liters per 100 km, or 21-23 MPG for my American friends, means a pitiful 400km (250 miles) per tank of 91 octane fuel in mixed highway and city driving. I don’t baby the car, nor do I drive like a maniac, not with that quickly moving gas gauge staring me in the face. I new what I was getting into when I purchased it, and it has delivered on those expectations. So, as per my previous post, I’ve been looking for an electric vehicle (EV), and have been smitten by the Leaf (even though that name is pretentious beyond belief). My goal is to sell the Subaru to a fellow enthusiast (still in progress), and use that to pay for the majority of the Leaf. The remaining finance payments will be covered by my not having to purchase any gas, or change any oil. Being able to charge at work definitely plays a major role in this decision. Insurance, unbelievably, is exactly the same as the Subaru. I have been looking at all the pros and cons for a year now. I’ve looked at the various Plug-in hybrids (Prius, Focus) and the Volt, I’ve driven the i-MiEV, and nothing seemed to really accomplish what I wanted like the Leaf, nor provide the bang for the buck in terms of gadgetry and performance. The end result? There is now a 2012 Leaf SL in my garage (with quick charger and cool little PV cell on the spoiler to trickle charge the 12V battery). Now we will see how this thing performs when I have to use it on a daily basis instead of just borrowing someone else’s. I just put 45 liters of gas into the Subaru, and I am hoping that is the last tank of gasoline that I will ever purchase for my personal vehicle. I am sure that I have some surprises in store. Will I run out of charge? 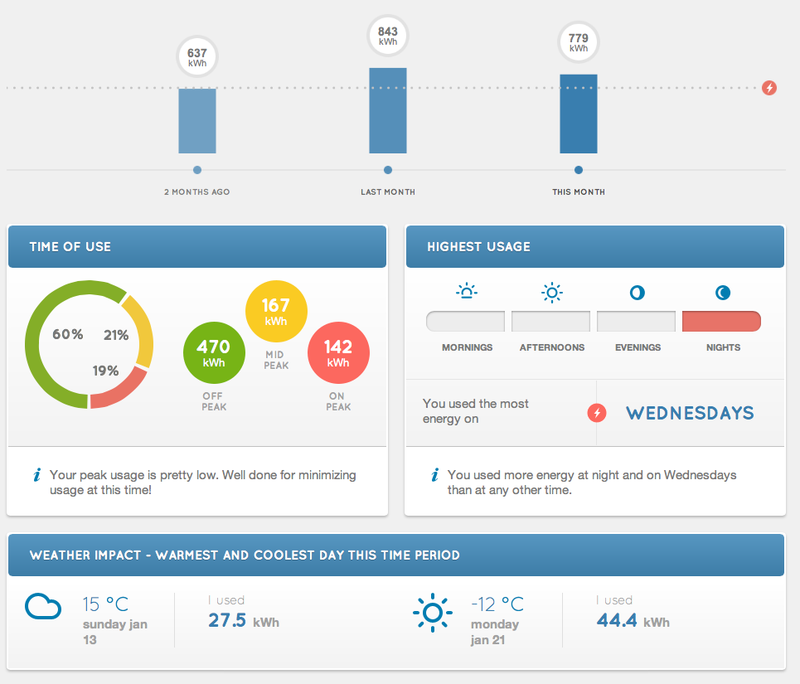 How much will my home energy consumption increase as a result of charging at home? How does it handle in a Canadian winter? How the hell do you use the navigation system? After just a couple of hours, I have managed to connect my garage door openers to the homelink system, enter my house as my home charging station on the GPS system (just in case I forget how to get home – do people actually use these features?) and top up the charge with the supplied trickle charger. The carwings app now has a home on my iPhone – just because I really needed a new app – and I’m remotely connected to be able to pre-condition the car while plugged in, check the charge status or start/stop charging. I will admit that I am stumped as to how I am going to get 220V power to the garage without tearing out drywall to access the top of the breaker panel. 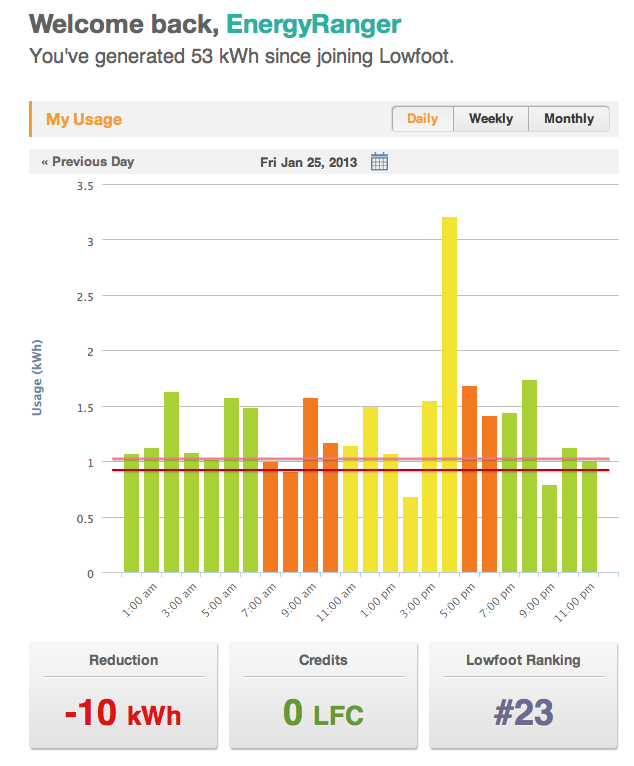 It looks like I will be taking advantage of Ontario’s EV Charging installation rebate that starts January 1. I have a feeling this will be a bit of an adventure as I currently renting my home (and content for a future post!). We still have our family minivan for longer drives like camping trips and visits to the grandparents. My wife can now use the Leaf around town for her errands, whereas she could not drive the manual gearbox WRX (I tried to teach her and I think the smell of burning clutch was just too much to bear). I think that the sky-blue leaf now occupying my garage will make an excellent addition to the fleet. I have spent my few spare minutes this past week (when not dealing with family life) investigating electric cars in earnest. The driving force behind this is the need that my current car has for (expensive) maintenance – a timing belt and clutch in the near future. I don’t want to spend the money on it. I’d rather use that money for a down payment on something that not only doesn’t need to have any oil change – ever – but that will not need to filled up with gas – ever. I’m not a fan of the plug-in hybrid (Prius plug-in, Chevy Volt, Fusion Energi, etc. ), as I think it’s just too much of a compromise. Over the last 6 months, I can count on one hand the number of times that I would have had an issue with the range of a Leaf or similar electric vehicle (EV), and the dramatic decrease in range as a result of carrying around the weight of a second powertrain just defeats the purpose in my mind. I have also had the luck to use a Leaf for two weeks through my day job, which I wrote about here, so range anxiety is not as large a concern for me as it might be for other commuters. The biggest hurdle for me to overcome, not surprisingly, is cost. A Leaf is $38,500+ the usual taxes, levies and new car fees. An $8,500 rebate from the Province of Ontario surely takes the edge of this price, but it’s still a barrier to entry for all but the early adopter. For more people to adopt EVs as a real alternative to the internal combustion engine, prices needs to come down, and that likely means that the cars need to be simpler. Thats why my drive today really had me thinking. I had a Mitsubishi i-MiEV for a trip to work, some photo opportunities during the day while charging, and then a trip home. Now, after my time with the Leaf, I was underwhelmed. The 120km range was still acceptable, but for $33,000, you’d think you would get a bit more car. I understand the economics, and that the battery cost is anywhere from 30-40% of the cost of manufacturing an EV. The Leaf has a lot of electronic whiz bang gadgets (really called telematics) that make me happy, but that completely baffle most people who are not tech-obsessed. Even putting the Leaf in gear takes some thinking, or training. 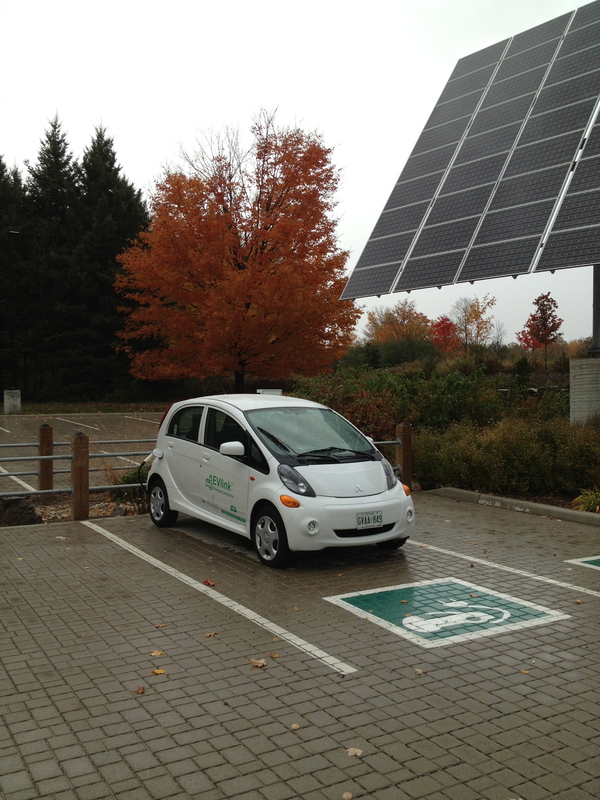 The i-MiEV (I have trouble even typing that, let alone trying to say it), is easy to understand. You sit in the seat, put your belt on, put the key in, and turn it. 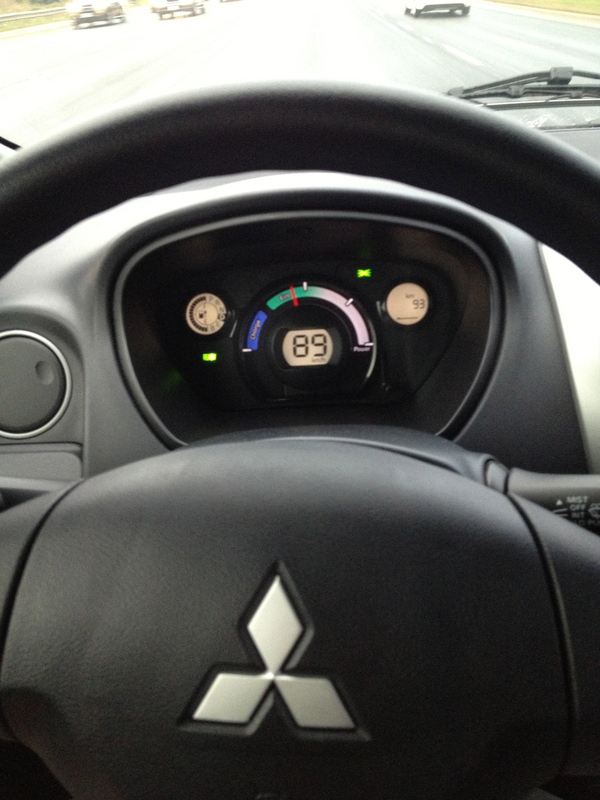 A beep signifies that you are ready to shift into gear, which is not a joystick, but a true P-R-N-D labelled shifter. It does have an eco-mode and a more aggressive regenerative mode, but really, how often does the average driver ever use anything but “d” anyway? Even the dash is easy to understand. Speed, charge status, estimated range, whether you are discharging or regenerating the battery, and thats it. No LCD displays telling you things that are neat, but really unnecessary. I think Mitsubishi is onto something – although not with the looks, as this is a face that only a mother could love – with the i-MiEV’s simplicity. Really, this simplicity is how EVs will go mainstream. IF prices come down. The built quality, driveability and general fit and finish of the i-MiEV feel like a $20,000 car. Its a shame, because it will turn a lot of people off an otherwise fine subcompact commuter car. I could see this car as perfect for a new grad – complete with $1,000 discount if you bring your diploma. 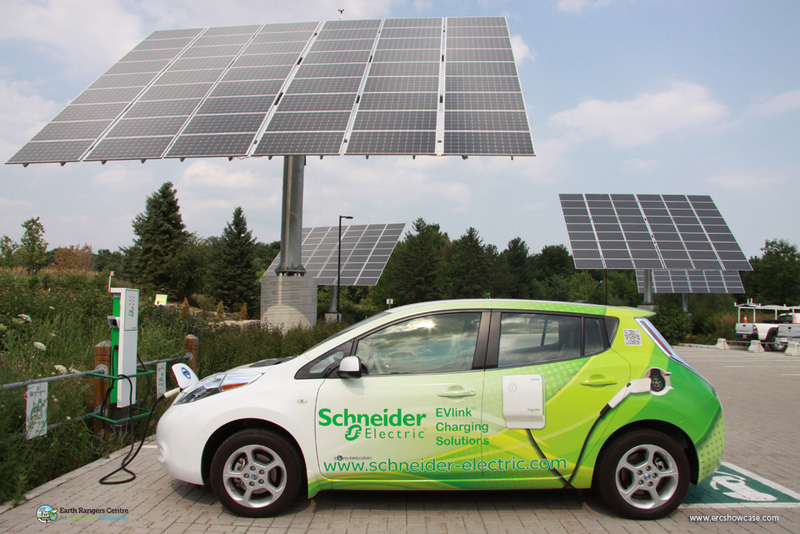 Simpler electric vehicles will take some of the fear of the unknown away from new buyers. Many new car owners might not want to consider an alternative from what they consider to be a “normal” car. Nissan, GM, Ford and other EV manufacturers could learn a lesson or two from the i-MiEV’s simplicity. As for my car search, the Leaf is still my preferred EV. The Volt is too expensive and its performance is a compromise, and the i-MiEV just doesn’t provide enough value for me. I have to see what I can sell my Subaru for, and deal with payments (that will be offset in whole or in part by gas/maintenance savings). Stay tuned to see what’s next in my EV saga.